Social media is one of the most effective ways to market and grow a business today – yet many entrepreneurs don’t utilize this invaluable tool. It is crucial for any business to have a marketing plan and part of that plan should be a social media strategy. Covering all aspects of social media marketing – including trends, strategies, analytics, the newest social networks and more. This workshop will show you exactly how to use social media to drive real results and keep you on the leading edge of social media marketing. Discover the most important aspects of social media marketing. What you MUST know to stay ahead of social media for business. 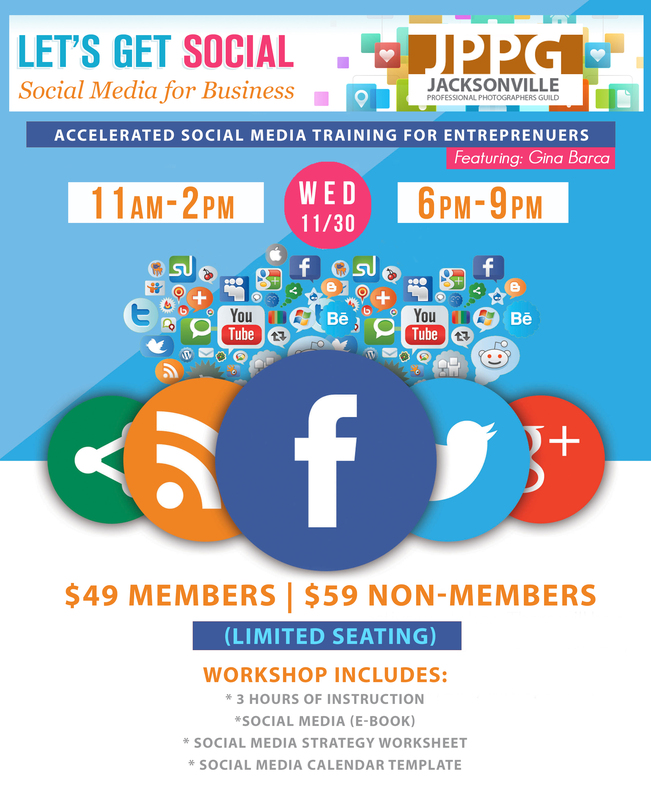 Get results and grow your business using social media like a PRO. We limit attendance to ensure an intimate environment where you will have the opportunity to ask questions and receive personalized attention. There are TWO separate times available. Please use the drop down box to register and select the time that works best for you. EARLY BIRD PRICING AVAILABLE! Whether you’re a JPPG Member or not, early bird pricing is available! If you register below by Friday, November 25th, 11:59pm, Members can take advantage of the $39 early bird price and Non-Members can take advantage of the $49 early bird price. That’s a $10 savings for registering early! The price on the flyer above will be applied to any registrations after the November 25th, 11:59pm early bird deadline. This entry was posted in Educational Program, Mini Seminars and tagged Education, Gina Barca, Mini Seminars, Social Media by admin. Bookmark the permalink.